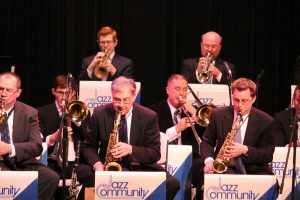 Back by popular demand, Jazz Community Big Band returns to Cutting Hall Performing Arts Center, 150 E. Wood Street, in Palatine on Sunday, April 23 at 3:00pm for a Musical Matinee concert. Jazz Community is an 18-piece big band playing the music of Count Basie, Duke Ellington, Stan Kenton, Thad Jones, and many more. Concert only tickets are $8.00 and can be purchased in person at the Cutting Hall Box Office, by phone at 847.202.5222, or online at CuttingHall.org. A limited number of all-you-can-eat Prime Rib and Pasta plate dinner and concert package tickets are also available for $35.00 per person. Dinner will be available at Emmett’s Brewing Company, 110 N. Brockway Street, in Palatine immediately following the performance. Jazz Community Big Band was established in 1976 by its late founder and director, trumpet player and music educator, Bill May. The band played at a variety of venues in the Chicagoland area for over 12 years until it disbanded with the untimely passing of Bill May. In the fall of 2011, Jazz Community reunited to honor Bill and celebrate his life’s work. Under the leadership of Bill’s sister, Marianne May, and co-music director Leo Kawczinski, Jazz Community got back onto the jazz scene. Musical Matinee attendees will each receive a complimentary goody bag and one free raffle ticket with the option of purchasing additional tickets at the theatre to benefit the Palatine Park Foundation’s Susannah’s Gift scholarship fund. This dedicated scholarship fund helps Palatine residents in need of financial assistance participate in Palatine Park District cultural arts activities. In addition to Musical Matinee’s presenting sponsor, Plum Creek Supportive Living, support has also been received for this event from the following gold level sponsors: AMITA Health, Andrea Donovan Senior Living Advisors, Re/Max at Home/Cindy Eich Team, Kiwanis Club of Palatine, Palatine Township Senior Center, Tamarack Senior Living, Photos Hotdogs, and The Grand at Twin Lakes. For more information, call the Cutting Hall Box Office at 847.202.5222, or contact Ashley Schiavone, Cutltural Arts Coordinator, at 847.496.6237 or aschiavone@palatineparks.org.